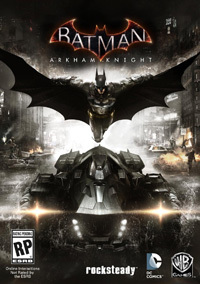 Batman: Arkham Knight is the fourth part of the action series about the Dark Knight. After weaker review of part three entitled Batman: Arkham Origins, the publisher decided to entrust the work to the Rocksteady studio again. The studio is responsible for the success of the first and second part of the game: Batman: Arkham Asylum (2009) and Batman: Arkham City (2011). The action of Batman: Arkham Knight like in Hitchcock starts with an earthquake. Scarecrow, an old enemy of Batman, has placed a bomb with fear toxin in Gotham City. The confusion as a result of the evacuation of the city’s inhabitants has been used by the most dangerous enemies of Batman. They dominated the deserted Gotham City, pushed on the defensive police with the head of Gordon commissioner and united to finally defeat the Batman. Among the villains were Penguin, Harvey Two-Face Dent and Harley Quinn. In addition, there appear one, new enemy of the Batman – the title Knight of Arkham. The game gets stuck at 10%, in the clock tower while batman tries to scan the CCTV to confirm the vehicle. Could you please help? may be a dll or something is missing. Part 7 ,part 17 , part 26 are corrupted . What should I do Mr. Awesome?